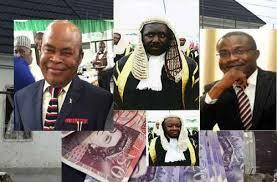 Biafra: Buhari’s Dogs The DSS Alleged Arrested Judges Has Been Granted Bail: But Why Was Corrupt John Tsoho Not Arrested? The State Security Service alleged it has released all the judges arrested during a nationwide sweep between Friday and Saturday, according to PREMIUM TIMES report. Nevertheless, Buhari’s so called fight against the judiciary is nothing but a charade, geared at witch-hunting opposition to his tyranny. DSS is Buhari's personal dogs and will go to any length to satisfy their master. If any judge needs to be behind bars, that person is no other but Justice John Terhemba Tsoho of the Federal High Court Abuja; who has perverted justice in the case of Kanu and shamefully recused himself few weeks ago.